Most reports agree that the top issue for discussion is a meeting between the two heads of state, which Trump suggested late last year would occur early this year. A report in the Washington Post this week suggested that diplomats had already agreed on a location for the summit – the beachside resort city of Danang, Vietnam – but not on the date, though the event would most likely take place in March or April. Prior reports had suggested that the two sides preferred Hanoi, the Vietnamese capital, for a meeting, though the Vietnamese government is eager to bring attention to Danang for tourism purposes. Prior to Kim Yong-chol’s visit, reports surfaced this week that another senior North Korean official, intelligence chief Suh Hoon, traveled to Washington as recently as last week to meet with his American counterpart, CIA Director Gina Haspel, with a similar issue docket to Kim’s: the planned Trump-Kim summit. American officials did not confirm those reports, however, which primarily surfaced in South Korean media. 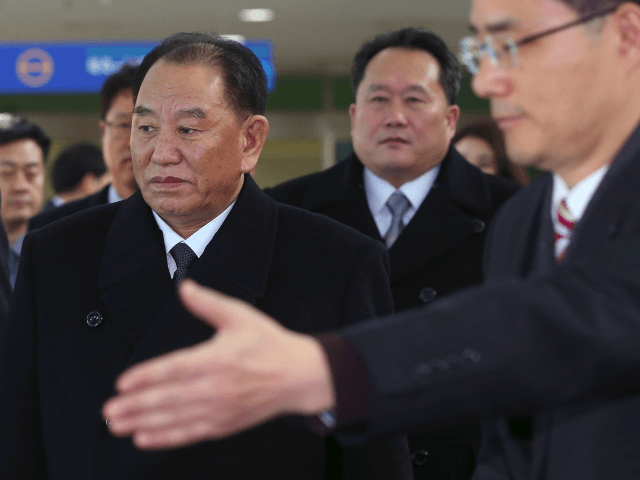 The South Korean government, led by leftist President Moon Jae-in, has been keenly watching relations between North Korea and the United States. Moon has made clear he wishes to see an end to the Korean War – technically still in effect despite no hostilities between warring parties since 1953 – and has urged the United States to push for an end to the sanctions currently preventing North Korean from legally participating in much of the international market. The Trump administration has refused to ease sanctions because North Korea has taken no steps to dismantle its illegal nuclear weapons program, which prompted the sanctions. During the last summit, the two leaders signed a declaration agreeing that they wished to see the “denuclearization of the Korean Peninsula.” While Washington defines this as an end to the North Korean nuclear program, Pyongyang claims that this requires a total absence of U.S. troops in Korea, impossible so long as the Korean War technically continues. Experts speaking at an event hosted by the conservative South Korean newspaper Chosun Ilbo this week suggested that a second round of talks between Trump and Kim may result in some concessions to Pyongyang to ensure that Kim continues engaging in talks, even though his officials have plenty of incentive to do so in the form of expensive food and lodging in some of the world’s biggest capitals.